Endangered and almost extinct, the rare Crested Dorada Bird is nesting in the back of one of the CD Tenerife goals safe in the knowledge that it will not be disturbed. 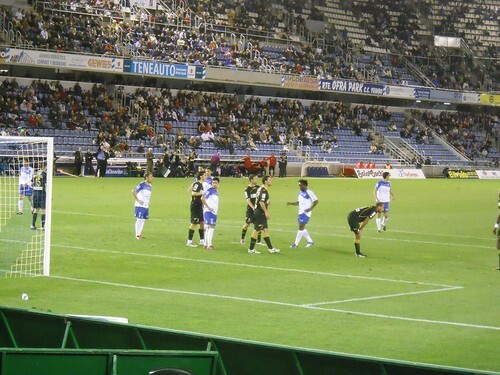 CD Tenerife have failed to score this season in the Grada Popular end, noisy home to the Armada Sur and many of theÂ otherÂ peÃ±as and despite Tenerife netting twice in last nights 2-2 home draw with Granada, that sad statistic continues. So much for the week of 3 home games, the points are slipping away and new coach Antoino Tapia is probably wondering what he has walked into. 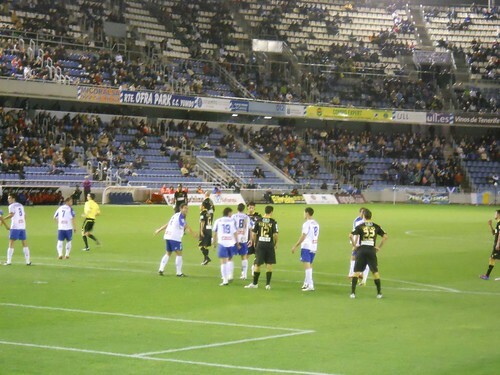 Leading 2-1 against 10 men, Tenerife wasted a golden chance in this game in hand, re-arranged after the air traffic controllers strike meant Granada couldn’t make the original fixture. It was a pig of a night, raining and chilly and that was refected in the 11,146 crowd, I even had to dig out my coat for the evening – wish I’d taken my snood. There was an improvement in the first half, play was crisper with the ball on the ground more and earlier crosses pinging in. Juanlu and Alvarez started in place of Natalio and Kome and Hidalgo had one of his best games in a home shirt. Granada have done well this season and were sitting in 8th place and showed their class after 15 minutes when Benitez curled a perfect free lick past Sergio in the Tenerife goal. It was soon all square when 5 minutes later Alvarez set up Hidalgo who took his chance well prompting a strong spell from the Santa Cruz side. For once Tenerife got a decent break when Orellana picked up his second booking after 30 minutes and was sent off, Tenerife made it count almost immediately with Alvarez finishing off a good move to take the lead. The second half saw old errors creep back into the home play and Nino was again struggling alone up front, a headed chance went begging underlining the need for another option in front of goal. It was tense stuff, the Granada keeper teased with some sloppy moments and Natalio and Kome took to the pitch for Bertran and Omar. The equaliser was a soft goal from Calvo, Sergio seemed to be comfortable with his shot but but it evaded him to tie the match. Tenerife finished strongly, Natalio looked through but the visiting keeper came good and a scramble in the area just needed a touch but neither Nino or Kome could connect. A draw clawed back a point on the other relegation candidates but with just days left on the transfer window we still live in hope of at least 2 more players.